I wrote a book. It is in the editing process now. The cover is finished. And the miracle is I only started actually writing it last week. God is pretty amazing. It is a decluttering book written from a Christian perspective because I can’t seem to do anything else. It is in 3 parts: Preparing your heart, practical advice, and then a bit on maintenance. So there it is. This should be interesting. A recent question on the CU Facebook group got me thinking about my experience with too much stuff and how God got a hold of me– which is why our house is no longer cluttered and it is actually easy to find what we need or want and keep it clean. I have always collected things. Old books, lots and lots of old books, vintage toys, rocks, vintage clothes, you name it. When I was a kid my floor was completely covered with stuff and intermingled with toys and books and clothes were fossils, lots and lots of fossils collected from our limestone driveway. When I went to college, I packed up most of my stuff and moved into a teeny tiny dorm room. It was covered in stuff all the time. When I got a job as a nanny and moved out I took ALL my stuff with me– most of it never got unpacked– boxes and boxes and boxes of stuff. And I still couldn’t keep my trailer clean because I had too much stuff. Same happened when I got married. And then proceeded to move multiple times, and I took everything with me. When we finally settled down here 11 years ago I had boxes stacked in every closet, more books than shelves, the kids toys and clothes overflowed every possible nook and cranny. The floor was constantly overwhelmed with our stuff. I couldn’t keep up with the basic chores because I was dealing with 3 little ones (Issac was born 10 months after we moved in) and we had too much stuff. Too many shoes? We figured out that they only wore about 3 pairs of these each. Most didn't even fit! So I started. I started small. I looked at the coat rack and my pile of coats– I still had winter coats that I had had in school, and ones that had been given to me by family members who were getting rid of (being the only married kids in the family with the only grand-kids- EVERYONE gave us stuff.) So I looked through my coats and got rid of half. Those all went to the thrift shop. I realized I could suddenly find the ones I wore with no problem, instead of knocking everything down every time I tried to grab one. Then I went through my shirts. I got rid of the ones that didn’t quite fit, the ones that weren’t flattering, the ones that I didn’t really like to wear. By the time I was done I could close my drawer. And it went on from there. I got rid of half our dishes. Half our books. Even half our food (turns out we had a whole lot of stuff in the pantry that had been bought that we couldn’t or wouldn’t eat– that all went to the food pantry in town.) I went through the old paperwork and got rid of the surplus (which was more than half and went to the burn pile.) And so, in the matter of about 6 months, I had gone through the entire house and gotten rid of half of everything. This train only left the house this year as Issac decided it was time to share it with someone else. Much of the rest in this picture, taken in 2006, is long gone. By that time we had a lot less stuff though not near as little as we do now. It ended up being a good thing (or you could consider it God blessing us) because in August a friend started dropping stuff off at our house that they didn’t want (she was cleaning out her house) and suddenly we had more stuff– some of which we really needed or had been wanting. And then my parents, who were divorced both remarried, combining multiple households and started dropping off stuff THEY didn’t need. And a neighbor started dropping off things her grand-kids didn’t want. 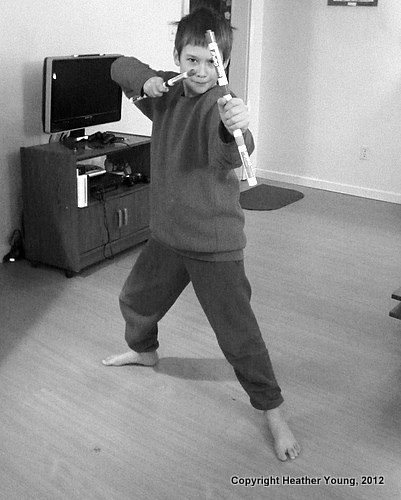 Issac does Kung Fu with marker sticks in our fairly simple living room. The kids pitch-in and help get rid of because they like being able to find the things they enjoy. Pretty soon I was in the habit of going through, only keeping what we would really use, and getting rid of the rest, recognizing that God clearly WAS and would continue to provide what we needed, when we needed it, and we didn’t need to hold onto all that stuff. Because that was all it was. Stuff. Even the things with sentimental value were just things, things that were getting in the way of my peace, of our family’s peace, even in the way of my relationship with God because I wasn’t trusting Him, I was trusting stuff. So now we keep the clutter down, regularly going through and getting rid of, and focusing our time on better things than maintaining stuff. Less clothes=less laundry, less dishes= people will rewash instead of leaving the dishes to pile up, less toys means the kids can find what they really want to play with, less stuff we don’t use means we can focus on what we DO use. All in all halving everything was the beginning of a much healthier lifestyle for all of us and God continues to bless us as we willingly pass on the things He gifts to us. I realize a lot of people no longer use RSS feeds and many use Facebook to follow posts on their favorite blogs. So, my question to you (given that I plan to continue posting more frequently): Should “An Untraditional Home” have a Facebook page? Would that be helpful? Issac does Kung Fu with marker sticks. 1. What is something Mom always says to do? If I make her tea or clean up the living room. I don’t know, I forget. I don’t know because I am usually asleep. When you finish a painting. We both make weird faces sometimes. You listen to what I am talking about.